As we head into the heart of summer, the weather becomes a critical factor in determining the quality and quantity of the vintage. When I visited Franciacorta in early June, I learned that the vegetative (growing) cycle in the eastern part of the appellation (Gussago and Cellatica townships) is roughly twelve days ahead of the norm (as in a classic vintage like 2013). 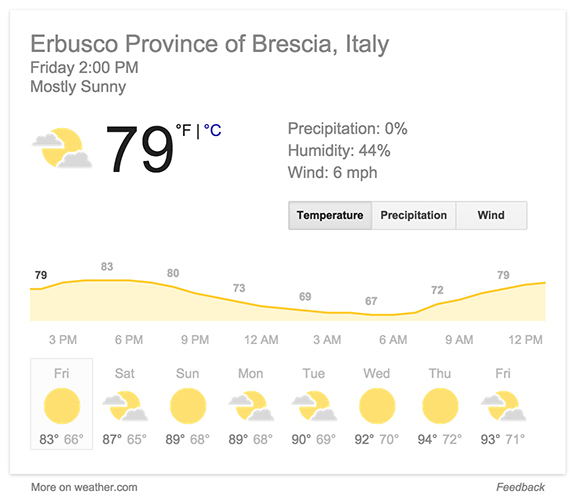 Erbusco in the central part of the appellation is still inline with being a classic vintage, although some of the more sunny spots are a few days ahead of the norm. The same holds for Paratico in the west while Coccaglio in the south is aligned, more or less, with the norm. The fact that the eastern part of the appellation is slightly ahead is not a bad sign nor an indicator of a lesser quality vintage. It just means that growers will probably be picking earlier than their counterparts in other areas. Harvest could begin as early as mid-August but the next six weeks represent an eternity in grape growing time. All of the year’s work culminates in this wind up to harvest. And weather events — rain, hail, high or low temperatures etc. — will play a crucial role in determining quality and quantity. If you look at the screenshots below, all taken at around 2 p.m. local Franciacorta time today, you can see that Gussago in the east is slightly warmer than the other areas. I’ll be following the weather closely here on the Franciacorta Real Story blog and I’ll be posting updates regularly. Stay tuned! Previous post ← Franciacorta at Aspen Food & Wine: You’ve come a long way, baby!